Rooted in tradition, branching out to the future. 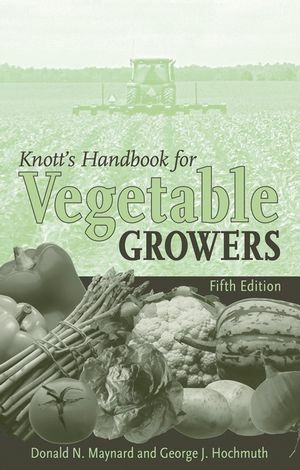 For more than half a century, Knott's Handbook for Vegetable Growers has provided generations of commercial growers with the most timely, accessible, and useful information available on the subject. The Fifth Edition of this highly regarded horticultural mainstay provides readers with the reliable growing and marketing information they've come to expect, while including new and updated material throughout to maintain its relevance in our ever-changing world. Filled with valuable information, largely in the form of tables and charts--from hard statistics on vegetable production and consumption to essential information for today's international markets, such as vegetable botanical names and vegetable names in nine languages--Knott's Handbook is part Farmer's Almanac, part encyclopedia, and part dictionary. It also provides detailed, practical specifics on planting rates, schedules, and spacing; soils and fertilizers; methods for managing crop pests; greenhouse vegetable and crop production; insect pest identification; harvesting and storage; and vegetable marketing. DONALD N. MAYNARD is an internationally recognized authority on vegetables. He is Professor Emeritus at the University of Florida and is a past president of the American Society for Horticultural Science. GEORGE J. HOCHMUTH is an internationally recognized authority on vegetables, through his previous bimonthly column in American Vegetable Grower and other works on vegetable production. He is Professor of Horticultural Sciences and Associate Dean for Research at the University of Florida. Both authors have been recognized repeatedly for their contributions to the vegetable industry and are Fellows of the American Society for Horticultural Science. PART 1: VEGETABLES AND THE VEGETABLE INDUSTRY. 01 BOTANICAL NAMES OF VEGETABLES NAMES OF VEGETABLES IN NINE LANGUAGES. 04 CONSUMPTION OF VEGETABLES IN THE U.S.
06 NUTRITIONAL COMPOSITION OF VEGETABLES. PART 2: PLANT GROWING AND GREENHOUSE VEGETABLE PRODUCTION. 03 TEMPERATURE AND TIME REQUIREMENTS. 06 FERTILIZING AND IRRIGATING TRANSPLANTS. 09 ADDITIONAL TRANSPLANT PRODUCTION WEBSITES AND REFERENCES GREENHOUSE CROP PRODUCTION. 15 ADDITIONAL SOURCES OF INFORMATION ON GREENHOUSE VEGETABLES. 03 TIME REQUIRED FOR SEEDLING EMERGENCE. 05 PLANTING RATES FOR LARGE SEEDS. 13 ADDITIONAL SOURCES OF INFORMATION ON PLASTICULTURE. PART 4: SOILS AND FERTILIZERS. 01 NUTRIENT BEST MANAGEMENT PRACTICES. PART 5: WATER AND IRRIGATION. 01 SUGGESTIONS ON SUPPLYING WATER TO VEGETABLES. 06 DRIP OR TRICKLE IRRIGATION. PART 6: VEGETABLE PESTS AND PROBLEMS. 05 PESTICIDE APPLICATION AND EQUIPMENT. 10 PEST MANAGEMENT IN ORGANIC PRODUCTION SYSTEMS. 04 WEED CONTROL IN ORGANIC FARMING. 05 COVER CROPS AND ROTATION IN WEED MANAGEMENT. PART 8: HARVESTING, HANDLING, AND STORAGE. 02 GENERAL POSTHARVEST HANDLING PROCEDURES. 03 PREDICTING HARVEST DATES AND YIELDS. 06 CHILLING AND ETHYLENE INJURY. 09 U.S. STANDARDS FOR VEGETABLES. 01 SOURCES OF VEGETABLE INFORMATION. 02 PERIODICALS FOR VEGETABLE GROWERS. 03 U.S. UNITS OF MEASUREMENT. 04 CONVERSION FACTORS FOR U.S. UNITS. 05 METRIC UNITS OF MEASUREMENT. 06 CONVERSION FACTORS FOR SI AND NON SI UNITS. 07 CONVERSIONS FOR RATES OF APPLICATION. 08 WATER AND SOIL SOLUTION CONVERSION FACTORS. 09 HEAT AND ENERGY EQUIVALENTS AND DEFINITIONS. Bound in a new, flexible cover that allows the pages to lie flat and that is designed for hard field use. Updated material covers the important changes in allowable pesticide and herbicide use.